College was not the most well-spent four years of my life. I mean, I met wonderful friends, took fun classes, and ate an entire Entenmann’s Chocolate Chip Loaf while watching Buffy in my dorm room. So, you know, not a total waste. But I also had zero idea what I wanted to do post-college, and this made caring about my classes a non-issue, and panic attacks a common thing. By senior year I knew-ish that I wanted to write (back then it was for TV), but it was way too late to switch things up (I was already feeling the crushing weight of my student loans). So, I chose a major in the subject where I’d wracked up the most credits, and got the go-ahead to graduate! Happy day! 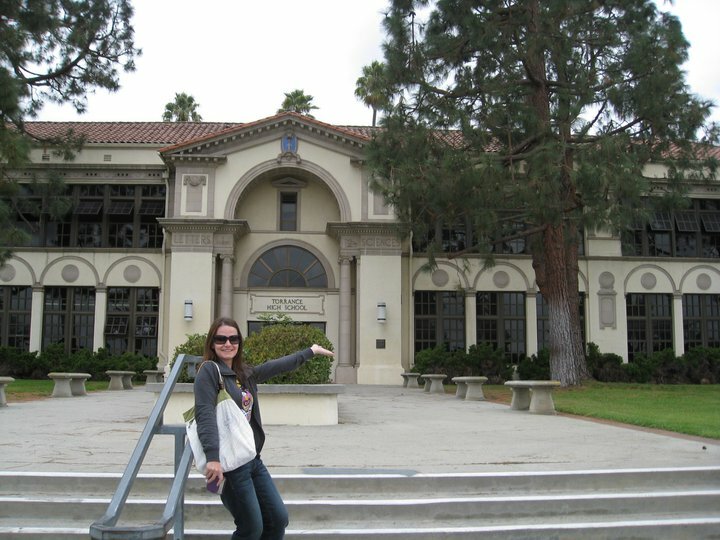 I’m at Sunnydale High!! Xander fell down those steps! I did a lot of writing after college graduation, but I wasn’t sure if YA novel writing was something I should pursue as more than a hobby. So, I decided to take an online writing class through MediaBistro and let me tell you, it was TERRIFYING. There were so many talented writers and, along with them, so many great ideas for their books. Better than me and mine, for sure! Still, I was learning so much that each compliment and criticism felt like money in the bank. In that class my instructor and classmates made me believe a writing career could happen. For me! For real! I remember pulling a coat from my closet and reflecting on the class when I thought how this was an incredible overlap of something I loved to do and something I could do. How rarely that happens. And it’s a feeling I pull up on the hardest of writing days, one that’ll stick with me no matter where my career goes (or doesn’t go!). These all sound like very great’ish moments Michelle. 🙂 The one that I wish I could have been a part of though is that U2 concert. At that moment in time, at that place, that must of been a very powerful experience. I saw U2 on that same tour and it was one of the best I’ve seen for a lot of the reasons that you listed. There were so many surprising little moments when people took a few extra seconds to be polite or help a stranger during the few weeks surrounding the concert, and they made me proud to live in NY. But just because of its size, that concert just spewed love and energy.